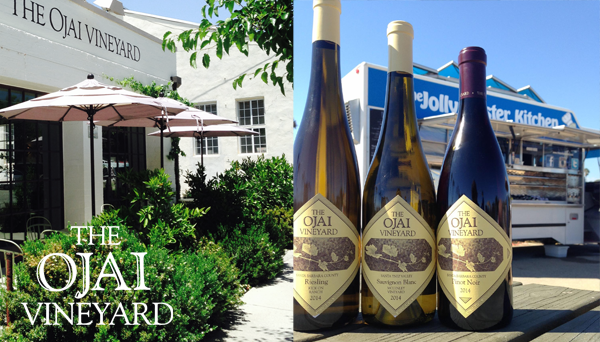 The Ojai Vineyard » Nov. 13th – Back by Popular Demand the Jolly Oyster at the Ojai Vineyard! Nov. 13th - Back by Popular Demand the Jolly Oyster at the Ojai Vineyard! Back by popular demand the Jolly Oyster Food Truck (click to find out more) with music provided by Ted Lennon at our Tasting Room. Friday November 13th from 5 to 8pm the Jolly Oyster Food Truck will be at the Ojai Vineyard Tasting Room to pair their delicious seafood with our seafood friendly wines. The event is open to everyone so please invite your friends! The tasting room becomes a wine bar for the event with wine available by glass or bottle. The wines for the evening have been specially selected to pair with The Jolly Oyster’s delectable delights. There is no cost to attend, just buy a few oysters and a glass of wine and enjoy! As usual, club members receive their discount on all wine purchased.